There's nothing better than a summer evening spent with family and friends—unless, of course, you add in great food and music. Now you have the perfect formula for fun. 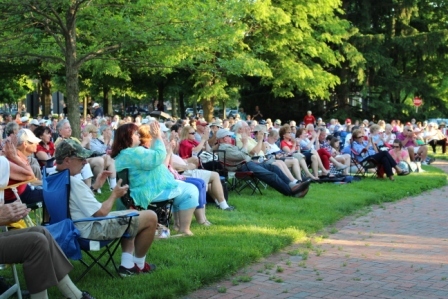 Luckily, you can experience it all summer long with the Family Concerts on the Green series sponsored by the Worthington Parks & Recreation Department. These family-friendly concerts are free for everyone, and all performances take place on the northwest quadrant of the Village Green (corner of High Street and Dublin-Granville Road). This year the concerts started in mid-May, and they will continue throughout most of August. "We've been working hard to bring new music to Worthington as there are so many talented performers and songwriters from this area," said Melissa Hindman, marketing and community outreach supervisor with the Parks & Recreation Department. "We went out and recruited many of our acts, when in years past we have only used acts that submitted their interest in performing." The remaining concerts scheduled for this season are listed below, but you can always find a complete listing on the Event Calendar at VisitWorthingtonOhio.com. Several local food vendors help to ensure that no one gets hungry during the concert, including Dewey's Pizza, Dairy Queen, Pizza Primo and Rivage Atlantique. Plans are already underway to expand these offerings next year. Concert sponsorships are also available, and this year The Laurels of Worthington and The Laurels of Norworth are sponsoring concerts. A sponsor's business is marketed before and after the concert, and sponsors are given the opportunity to meet and greet participants during the event. Hindman said the Department is currently searching for an area business to sponsor the entire 2015 season. Beginning last season, a few Saturday concerts were added to the lineup. Their success prompted the addition of three Saturday concerts this year. The first one took place on July 12 and featured a children's concert with The Shazzbots. Still to come are the OSU Alumni Band on August 9 and the Ohio 122nd Army Band on August 16. "Our goal is to highlight our great city, bring people downtown to experience our wonderful shops and amazing food, and give them a great performance in our beautiful park," Hindman said. "Rob Mottice is the supervisor of the concert program, and he has worked very hard to enhance the existing program. He helped acquire a new sound system that has given our listeners an enhanced experience. He has ties to many local musicians, and has worked all year to bring a variety of high-quality, local performers to Worthington." All Sunday concerts and remaining Saturday concerts begin at 7 p.m. Parking is available at Kilbourne Middle School, Griswold Center, Worthington Library, Huntington Bank and the Worthington Presbyterian Church. Restrooms and drinking fountains are located at the Griswold Center, directly north of the performing group. Parks & Recreation staff members will be present at all concerts to answer any questions. Find out what's happening in and around Worthington. Check out the event calendar at VisitWorthingtonOhio.com and "like" us on Facebook at Visit Worthington Ohio.